This is the fourth DVD presentation the independent transport videos studios have made featuring the buses of Southampton. This programme features some archive video filmed in the city in 1989 and 1993, as well as our own footage filmed in 2014 and 2015. We start with 1989 and the camerawork from Malcolm King. 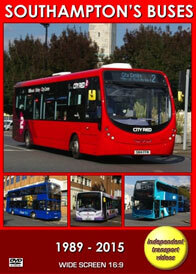 Here we see Southampton Citybus in both red and cream and the new red and black liveries. East Lancs bodied Dennis Dominators are running alongside former Corporation Leyland Atlanteans. We see their first Leyland Lynx in all over white livery and Solent Blue Line in their striking two tone blue with yellow livery running Optare Delta single deckers alongside mostly ex Hampshire Bus Leyland Nationals and Bristol VRTs, some still in NBC Poppy red and white livery. We now move forward to 1993 with archive video filmed by Joe Ward. Here the former Corporation Atlanteans seem to rule the road in their red and black livery. Solent Blue Line have now brought in second-hand Bristol VRTs transferred from the Isle of Wight and are seen running in Southern Vectis deregulation green and cream livery, but with SBL fleet names. There are also second-hand highbridge Bristol VRTs from Cumberland, which originated with Ribble. Some Wilts & Dorset Leyland Olympians and Bristol VRTs are also recorded as well as a Provincial Leyland National. We now move forward twenty-one years to 2014, and with our own cameras visit Hythe, situated across the Solent from Southampton where we see the modern day SBL, now called Bluestar and owned by the Go-Ahead group. Mercedes-Benz Citaros are seen running alongside a First Dennis Dart on a local service – since filming this Dart has moved to Camborne in Cornwall. We now move on to 2015 and catch up with the changes in the city of Southampton! Our filming takes place at a large number of locations, all of which are subtitled in the programme. Locations include Hanover Buildings, Bargate, Portland Terrace, Vincents Walk, Pound Tree Road, Castle Way, High Street and many more. The buses are now operated by two major operators. First Southampton which are mostly in a smart two-tone red version of the First corporate scheme, and are branded as ‘CITYRED’. Vehicles include many new Wright StreetLites, Wrightbus bodied Volvo B7RLEs and Dennis Tridents with East Lancs bodies. Go South Coast is the parent company of Bluestar. Here we see a modern fleet of ADL400s, also route branded, with some Scania OmniCity double deckers. Most saloons are Mercedes-Benz Citaros, but Dennis Darts and Wright bodied Volvos are also operated. Southampton is also home to a large Unilink fleet. Operated by Go South Coast, this modern fleet of mostly 10.2m ADL400 two door double deckers, run a network of services for the students of Southampton University. These services are also available to the general public and some single deckers are operated. Wilts & Dorset also make an appearance in Southampton. On this programme we see Tilling liveried East Lancs Scania OmniDekka, 1020 (YN06 JWX), on route from Salisbury, the livery celebrating the Company’s 100 years. However, the Wilts & Dorset name has now been dropped in favour of Salisbury Reds. Local independents are represented by Xelabus and Wheelers in this programme of the buses of Southampton, which we hope you will enjoy!